Ah, what would I update next at Walt Disney World? Realistically we know the Disney Parks are constantly changing and improving but they just can't do all they'd like to do. Well, let's pretend financial and creative resources are unlimited for this discussion. My favorite park is Epcot so I'd put my imaginary refurbishment dollars there. Future World would be my main focus. The park is a terrific blend of entertainment and education. It plays host to the largest festivals at WDW however it needs a little attention and in my dream world, it will happen. First, let's start with The Seas with Nemo and Friends. The undersea ride is fun and I like that they put something back in that area. However, it still feels like the pavilion lacks cohesiveness. Once you hop out of the clam shell, the place feels like a random hodgepodge of exhibits even with several sporting Nemo themes. Somehow the flow through that large building also needs to be improved. More of an A to B to C rather than simply wandering. Continuing on to the Imagination pavilion. Where to begin? On the plus side, the fountains are great fun to watch and kids love them. It was certainly time for Honey I Shrunk the Audience to leave the theatre but I hope Captain EO is just a temporary filler while something new and interesting is being prepared. I always try hard to look at the details in the preshow area and I love Figment but I don't love the current version of the ride. Here's where we'd call in those unlimited creative resources to bring us something awesome in both the ride and the interactive theatre. The Wonders of Life pavilion is now only used for special events. Come on fictional "skies the limit" resources, let's do something amazing over there. And again, since I am dreaming....The Land's popularity skyrocketed with the addition of Soarin' and it's always super busy. I'd love to see flow improved here too. How about moving the Fastpass distribution machines outside to cut down on some of the "running in as fast as possible" crowd? I wouldn't do much to Test Track (other than the maddening song in the queue) and Mission Space. I know some want to update Universe of Energy since Ellen's sitcom has been off the air for years. Personally, I wouldn't. Not even with my fictional dollars. Too low on the priority list. What great ideas! Why didn't I think of that?! Epcot is probably my favorite park as well - but I much prefer World Showcase. That is some list. But I agree with them all. Especially the Living Seas. Great ideas. I would love to see the Seas improved. So many people leave without visiting the tanks, I think most don't even know they are there. Great ideas Amy!! I really wish that they would come up with something permanent to put in the Wonders of Life pavilion, as well as The Odyssey. You're right, it's also time for Captain EO to be replaced. And it's too bad about the Wonders of Life Pavilion being empty most of the time. What happened to Imagineers being Imagineers? 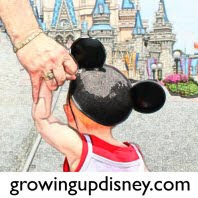 Guest Post: Disney Magic is an Amazing Thing! "Pathology in the Hundred Acre Wood"
A Walk Around The World With Ridge--New Addition!